The global fortified edible oils market is a competitive business landscape characterized by several players with a worldwide presence. Some of the key players in the market are Conagra Brands, Inc., Bunge Limited, Ruchi Soya Industries Ltd., Adani Wilmar Limited, and Archer Daniels Midland Company. The fortified edible oils market is witnessing an intense global competition currently. Major players are competing to grab the largest share of the global pie with new product launches and heavy marketing efforts. Many large players are keenly looking out for new opportunities in emerging market. Availing a wide range of distribution channels is proving to be effective for many companies. The current efforts of most players in the fortified edible oils market are focused on building a valuable brand. According to the latest report by Transparency Market Research, total revenue generated in the fortified edible oils market in 2018 stood at US$10,207.1 Mn. The global fortified edible oils market is expected to rise at 3.4% CAGR during 2018 - 2026. Products with vitamin A are expected to hold the largest market share in the fortified edible oils market. 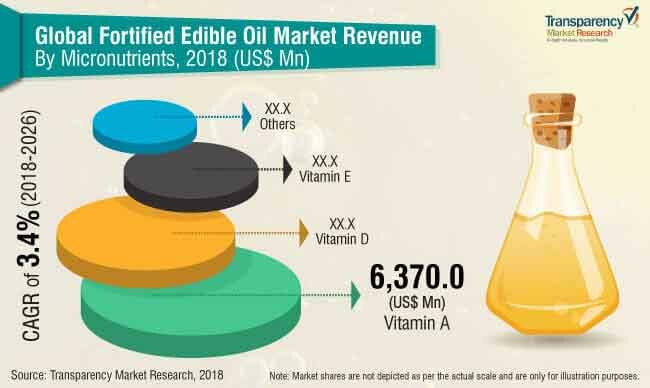 Increasing deficiencies of vitamin A and growing awareness about various disorders associated with it are expected to drive growth of the fortified edible oils market. Similarly, the fortified edible oils market in the Middle East and Latin America is expected to bag the largest share of the global market. Fortified edible oils are extremely prominent in cuisines in both the regions. Additionally, the expansion by global players in this region is expected to drive the fortified edible oils market growth. The region is expected to account for 34.0% of the global market share during the forecast period. Prevalence of malnutrition, vitamin A deficiencies, and health awareness drive the global fortified edible oils market. As major players in the market increasingly establish a presence in the emerging regions, the healthy brand of products will play a bigger role in driving the demand. These companies spend a considerable fortune in gaining high visibility with apt product placements. As new channels of distribution like online become more viable, the completion for quality branding is expected to go up significantly. Moreover, consumers are increasingly turning toward premium products in an effort to avail the best quality product. Due to considerable demand for quality products, various manufacturers are also voluntarily engaging in fortification of edible oils products. The global fortified edible oil market companies are moving to new markets and are faced with new dilemmas related to consumer preferences. In recent times, products with trans-fat free soybean oil, olive oil, and canola oil are emerging as key consumer preferences. Growing health consciousness, changing dietary preferences, and improving living standards in emerging economies are expected to drive growth of the global fortified edible oil market. During the forecast period, oils with low fat, calories, and cholesterol are expected to drive the market growth. Additionally, well developed sales network, both online and offline, represents a major opportunity for players in the fortified edible oils market.